Relatives of the missing footballer began a private search for his plane at the weekend. IT IS LIKELY that two seat cushions that washed up on the French shore this week are from the missing plane carrying footballer Emiliano Sala. The cushions were found on a beach near Surtainville in Normandy, Britain’s Air Accidents Investigation Branch (AAIB) said today. A light aircraft transporting the Cardiff City striker vanished from radar around 20 kilometres north of the Channel island of Guernsey on 21 January. 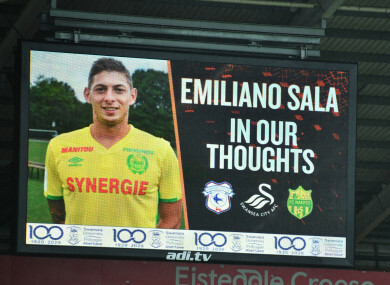 Sala, who moved from French club Nantes for a reported fee of €17 million, was flying from the French city to Cardiff. The AAIB said French authorities notified investigators that part of a seat cushion was found on the beach on Monday this week. A second cushion was found in the same area later that day. “From a preliminary examination we have concluded that it is likely that the cushions are from the missing aircraft,” it said in a statement. The AAIB has now identified a priority search area of approximately four square nautical miles, based on a detailed assessment of the flight path and last known radar position. It has commissioned a specialist vessel to carry out an underwater survey of the seabed to locate and identify possible aircraft wreckage. At the weekend relatives of the missing footballer began a private search for his plane after police called off their own rescue mission. The AAIB said it is aware of this privately operated search and is “liaising closely” with those involved to maximise the chance of locating any wreckage. Email “Seat cushions found on French beach 'likely' to be from missing Sala plane ”. Feedback on “Seat cushions found on French beach 'likely' to be from missing Sala plane ”.